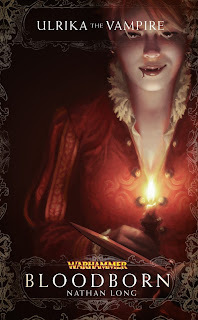 Lord of the Night reviews the thrilling first novel of the Ulrika the Vampire series, Bloodborn by Nathan Long. At first I was wary about trying a Vampire Counts novel, mainly because vampires are cool but they are being done to death in recent times, and Twilight isn’t exactly making them look good. But I was very gladly proven wrong as Ulrika’s first adventure as a vampire has already become one of my favourite Warhammer Fantasy series. Nathan Long has created a hell of a series here, please let it go beyond a trilogy, in terms of coolness Ulrika owns Gotrek and Felix. Newly-undead vampire Ulrika Magdova Straghov is struggling with her new powers and gnawing hunger for blood. Before she can master her powers she and her mentor, the Countess Gabriella von Nachthafen, are called to Nuln on a matter of the highest urgency. The Lahmians of Nuln are dying, torn apart by a beast and left exposed to the world. With Nuln turning into a powderkeg of fanaticism, just waiting to explode, the Lahmian’s at each other’s throats and a monstrous killer stalking them at every turn, Ulrika must learn what it is to be a vampire, master her powers and discover the killer before the entire sisterhood is wiped out. This novel has already become a favourite of mine. I have not read Gotrek and Felix but it explained the backstory very quickly and wasted no time beginning Ulrika’s own story which easily matches up to the series that it came from. I particularly enjoyed the detective element as Ulrika hunted down the killer, and that she stood out amongst the Lahmians as the only one who enjoyed a good fight. The characters here are very well written. Ulrika and Gabriella form a good pair that with level-headedness, willingness to fight and Gabriella’s practicality make them a hard duo to fight against. Ulrika’s turmoil over her vampire status is shown through her disgust at the way of life for a Lahmian and how they treat their victims, the latter of which truly offends her. Other characters include Templar Friedrich Holmann, who I enjoyed and agreed with Ulrika’s assessment of near the end of the novel, Countess Hermione and her protege Famke who oppose Gabriella and Ulrika at nearly every turn, and the mysterious killer that hunts the Lahmians, the true identity of which I did not suspect and was quite surprised by. The action of the series is riveting, we get to see the strengths and weaknesses of a vampire in battle. Super-strength, speed and alertness make Ulrika’s fights a joy to read, and silver and sunlight make them engaging as these weaknesses are truly weaknesses. Too often a protagonist can shrug off weaknesses that cripple others, Ulrika is a much more down to earth fighter and sunlight and silver can truly hurt her. I particularly enjoyed the fight with the murderer, it was a good length and really showed the killer’s abilities well. The pacing was very good, the mystery proceeded at a good pace and kept me interested the whole way through, I was always desiring to read the next chapter and see what would happen, only putting it down through force of will. The ending was great and saddening. Ulrika has taken her first steps towards becoming a vampire, and they are harsh ones to make, but she may make it one day. And though the immediate mystery was solved an even greater one was posed, one that to find out you’ll need to pick up the sequel Bloodforged. I give Bloodborn an 8.5/10 for an engaging story that left me wanting not only the sequel, but the third in the series as well, alas I must wait for that but not Bloodforged thankfully. Very glad I waited to pick this up, I don’t think I could have waited the year for the sequel. Should you buy this book? If your a fantasy fan then yes, if your curious about fantasy then yes again. This book will please long-time fantasy fans and ensnare newcomers with a great adventure. Lord of the Night reviews the stunning sequel to Bloodborn, Bloodforged by Nathan Long. Immediately after finishing Bloodborn I moved right onto its sequel. Bloodforged improves on its predecessor, certainly not an easy feat, and forces Ulrika out into the world, alone and against the terrors of the night. With a wealth of new dubious allies, terrifying villains and a quest to find a better way of life, this is definitely one of my favourite Warhammer Fantasy novels. Disgusted by the Lahmian way of life and the cruelty of vampires Ulrika decides to set out on her own and discover a way to live that does not involve ruining the innocent and preying on the souls that walk the night. Striking out for Praag, hoping to find old friends and new glories against the barbarous hordes of Chaos, Ulrika is disappointed to learn that no hordes will come this spring. But when she stumbles upon a Slaaneshi cult stealing girls in the night Ulrika is determined to protect the citizens of the war-torn city from the dark forces that would prey on them. But with opposition at every turn can Ulrika stop the cult, save the innocent and keep her vows to never again hurt the innocent to keep herself alive? This is truly a fantastic novel, teeming with mystery and intrigue, swords and magic, blood and war. It took me only two days to read this book, the first day I read to chapter 11 and the next day I finished the book by mid afternoon, a very good session. The final two battles were a particular delight to read, I also enjoyed the connection that Ulrika feels with humanity and the empathy she feels, may she never lose it. The characters in Bloodforged are a very well written group. Ulrika has evolved from the baby we saw in Bloodborn and has finally begun to show what she is capable of. 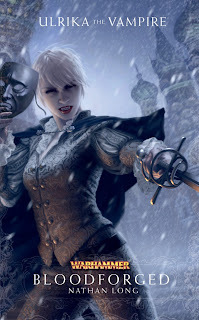 Her empathy for humanity makes her an ideal dark hero, and her desire to protect the denizens of Praag is what fuels her as she delves into the underworld of the icey city and finds against the servants of teh Dark Gods. Plenty of character growth sees Ulrika turn into a genuine hero that is only furthered by the hatred that humanity bears for her kind. Supporting characters include the mysterious Stefan, whose motives are hard to gauge as he joins Ulrika’s quest to purge the cult from Praag, with his own goals in mind. The Lahmian Raiza was a particular favourite of mine, a counterpart for Ulrika who enjoys duelling and was definitely not a typical Lahmian. The action has only improved as Ulrika gains her signature rapier and dagger combo, and kills plenty with it. Her fast sword style enhanced by her vampire status makes her fights epic to read as she tears through cultists and magic, fighting with every weapon at her disposal. Her fight in the amphitheatre was brilliant, how she moved near the beginning and her tactics against the enemy. The pacing was very good same as Bloodborn with the mystery being well written and timed, I simply couldn’t put Bloodforged down once I got into the swing of reading it. The ending was excellent. I loved Ulrika’s last choice in the novel, and her motives for doing it. It was sad but at the same time gratifying as Ulrika takes another step towards being a great hero. But now the biggest battle of her life and un-life is looming, and it will take every she has and more to survive the coming storm. I give Bloodforged a 9.5/10 for a gripping story, great characters that I want to see more of, and for making the wait to the third novel Bloodsworn unbearable. I WANT IT NOW!!! Should you buy this book? Yes, fantasy fans will love this novel and I would definitely recommend it and its predecessor to anyone who is considering fantasy for the first time. You will not be disappointed by this series. That is it for now, though once I finish my current project, Battle of the Fang by Chris Wraight you can all expect a review for that. Its good to be back. Ave Dominus Nox!